You can help CHD patients live longer, healthier lives. 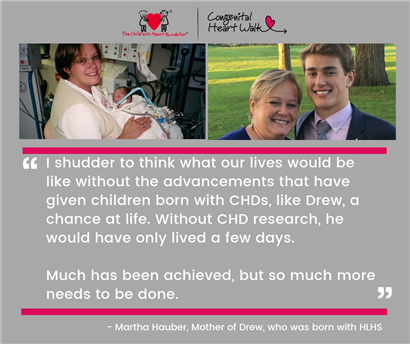 The Congenital Heart Walk series directly supports the mission of The Children’s Heart Foundation: to fund the most promising research to advance the diagnosis, treatment, and prevention of congenital heart defects (CHDs). The 2019 Congenital Heart Walk series will raise critical research funds in 20 cities around the U.S., bringing together 15,000 walkers, hundreds of teams and thousands of donors in the fight against CHDs. Come join us for the walk, family-friendly activities and entertainment, and the chance to strengthen our community. With your help, we are Placing Children at the Heart of Research. Join us October 19th, 2019 in Columbus! Please visit the Event Details page for more information.